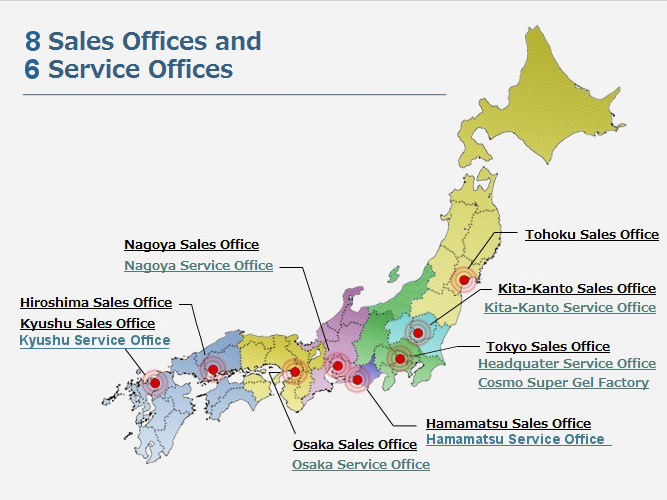 List of Offices in Japan | COSMO LEAK TESTER / COSMO INSTRUMENTS CO., LTD.
We offer total support from your initial inquiry to line operations. 1) We offer product explanations, present our track record of success, and respond to a full range of consultations. 2) We give advice about preliminary experiments and optimal testing methods. 3) We loan out PR equipment and hold workshops. 4) We support the equipment (machinery) manufacturers and handle the various kinds of trouble that can occur when installing equipment. Cosmo Instruments has put in place a full-scale service structure in accordance with the motto of “fast”. Please feel free to make an inquiry if you would like to consult with us about the handling of problems and trouble after the introduction of our products or about the implementation of inspections. We receive consultations about after-sales service through the Services Consultation Form. Cosmo Instruments has established a Service Department and put in place a structure under which the department can coordinate with the sales offices nationwide while offering a fast and flexible response to the consultations and troubles received from our customers. Furthermore, the information obtained through that process is centrally managed by the Service Department and given as feedback to the factories so that it can be utilized in the development of the next products.